That means the state raked in nearly $150 million in taxes. Under Amendment 64, which for legal recreational marijuana sales in Colorado beginning in 2014, $40 million of that amount will go to public school construction projects. The state’s public school fund will receive the remainder of the excise tax, with some of that money going toward substance abuse treatment and prevention, law enforcement, and healthcare programs. Industry experts expect Colorado to make $1.3 billion in marijuana sales for the year, which would mean the total economic impact in the state for legal pot sales would surpass $3 billion. 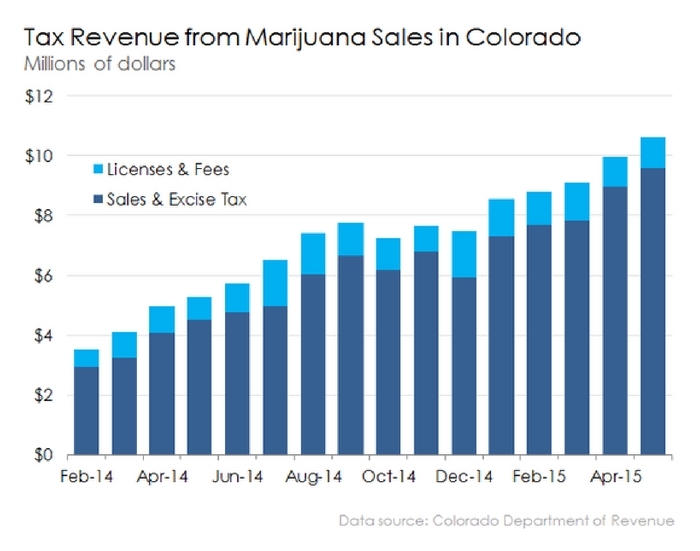 There are 3 different taxes on Colorado’s recreational weed – the standard 2.9% state sales tax, a special 10% sales tax, and a 15% excise tax on wholesale transfers. The 15% excise tax is what will go to school construction projects. Marijuana has brought other perks to the state, including 18,000 new jobs in 2015, and a noticeable drop in crime rates.